Garnish with ground Nutmeg or Cinnamon. **See our video for tips on whipping the cream into a thickened, yet pourable state. 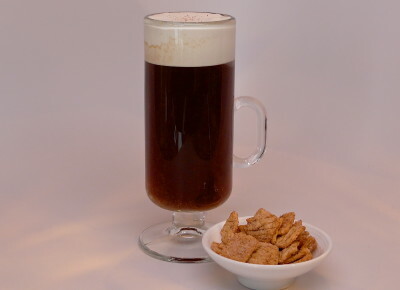 Our Cinnamon Toast Crunch Coffee is part of a complete CocktailDudes breakfast. You have your cereal, your dairy, your coffee and, of course, your booze. This is our fun and crazy take on the classic Irish Coffee. 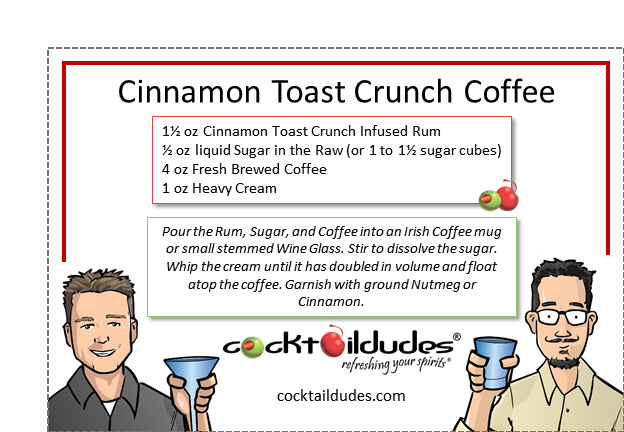 The Cinnamon Toast Crunch-Infused Rum has a sweet, rich, complex, cinnamony taste which pairs perfectly with fresh brewed coffee and cream. There is nothing better than a sip of cool sweet cream which is immediately followed by the flow of warm, boozy, sweet, cinnamon-flavored coffee. This cocktail is incredible! If you like it hot, be sure to check out our Lucky Charmed Coffee, Apple Jacks Coffee, and of course the classic Irish Coffee. If you’re in the mood for something cool, we have many other cocktails which utilize the Cinnamon Toast Crunch-Infused rum. Cheers!